Do you want to have a clean and organized home next year? Make these 10 resolutions that will help you keep up all year round! It’s the time of the year to start making resolutions again. Come the New Year, we all want to be better selves and live in a better home. Keeping home clean and organized is one of the best goals that a self-respecting adult can have. It’s a great goal but not so easy to keep up. Let’s make the next year count! We’ve made a list of the top resolutions to prepare for the next year to keep your home clean and organized all year round. These are the most valuable habits that an organized person can have. So let’s try and keep our homes neat enough so that the next major clean-up is a breeze. It’s a simple habit but a great resolution to have. Get up – make up your bed. If you leave the bedroom without doing it, chances are you’ll find your bedroom in less than a cozy and clean look in the evening. And that’s a big mood buster. Making the bed as you get up is just a great habit that every organizer person has. And it helps to keep your home clean and organized too. There’s nothing worse than a messy kitchen. You can get everything right as far as the design and decor goes but leave a mess after you cook and all your effort disappears. So don’t put cleaning off until after the meal, clean as you prepare and immediately after you finish. Don’t let the dishes pile up and don’t leave them when you leave the kitchen. This might be a hard habit to get into if you’re not used to cleaning as you cook. But it’s a great resolution to try. Get a lot of mail in your mailbox? Make sure you sort that immediately and don’t let it pile up. Consider getting a wall organizer if you don’t already own one in your home. It will help you sort it quickly, and you can use it for many other things too. On the same note, make sure you sort all your papers too. This includes magazines, newspapers, mail, notes, drawings, homework and other paperwork. Make sure everything has its place and always keep it in that place. Things can get out of control quickly and clutter up your home without you noticing. This might be an obvious one, but don’t let the trash sit in the can under your sink for too long. Anytime you leave home, make a habit to take out the trash, even if it doesn’t seem to be full yet. You’ll avoid the smell, and it won’t fill up unexpectedly. When was the last time you’ve gone through your stuff in the closet to purge anything you haven’t used in a while? Hoarding unused clothing and accessories is the number one cause of a cluttered and disorganized closet. Make decluttering a regular thing. Set a date once every few months and go through everything you own to purge anything you’re not going to use anymore. And be honest about it. Better yet, earn some karma points by donating anything that is still in good condition. You’ll free up a lot of storage space and feel good about it at the same time. This is a great habit to have, though it might be difficult to get into. It doesn’t have to be 15 minutes, too. As long as you dedicate some time to cleaning up every day, your home will look so much cleaner and organized. You don’t have to clean it up perfectly everytime either. Just look around your place for any things that are out of place, any unclean surfaces or stuff that needs to be discarded. This will help you keep the house mostly clean all year round. Another resolution that needs tackling is doing that laundry more regularly. Try to do it every day and don’t let it pile up throughout the week. It’s a much better idea to dedicate it time in a day than doing laundry weekly – it’s so much easier to manage! It can be part of your daily clean up too. You don’t have to do it all at once either. Just do a lost every day to keep it under control. A clutter free and organized laundry room or area can be a home decor feature too! A mudroom is usually the place to be ashamed of. The name says it all – it’s where you leave your dirty shoes, umbrellas, coats before entering the house and it can get messy and disorganized. But at the same time, it’s the first thing anyone sees when entering your home. So it’s about time you make the mudroom count in a good way. Organize and decorate it to be a welcoming space rather than something you’d want to hide away. Make sure you stock up on the microfiber cloth, wipes, and spray bottle cleaners to have them ready when you might need to do a quick clean up. Being out of cleaning essentials is an annoying situation to find yourself in, especially when you’re trying to keep your home clean. Have these supple in your bathroom and the kitchen. Better yet, create a portable cleaning kit in a basket so you can carry it around the home when needed. 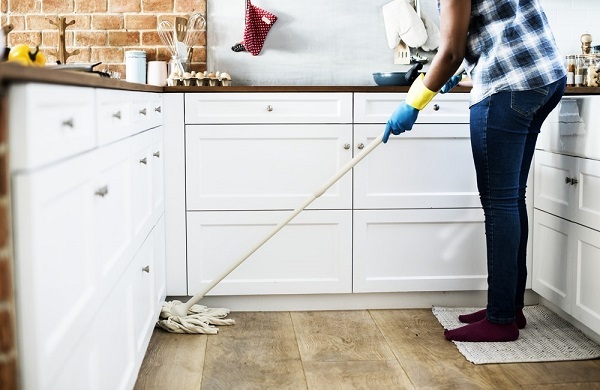 You want to keep your home mostly clean and organized before calling it a day. The last thing you want is to wake up to a mess. So make sure you do a quick final day’s clean up. It can be as simple as putting misplaced things in order and discarding unwanted items. After all, this is what making resolutions about clean home are all about.